As important as they are, internal audits are often frowned upon for being time and resource consuming. 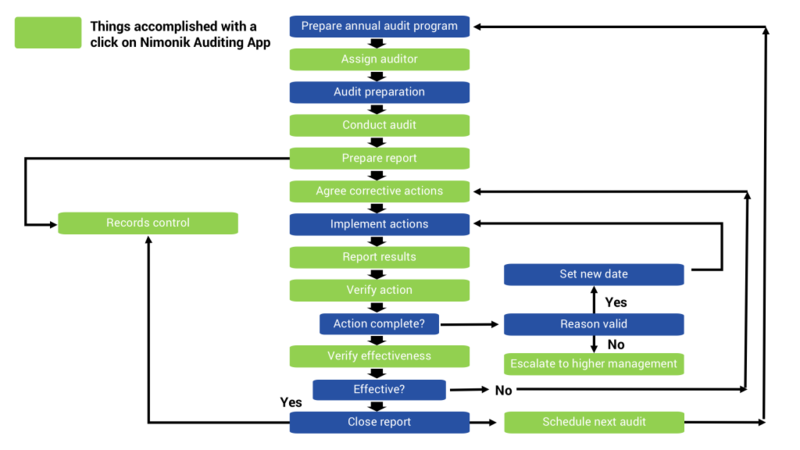 With modern technology like Nimonik you can reduce both audit planning time and audit time, reducing the challenge of internal audits at your organization. The purpose of quality audits is to establish, by unbiased means, factual information on quality performance. Installing a quality management system without some means of being able to verify whether it is doing its intended job is a waste of time and effort – hence the importance of internal audit requirement. Internal audits should be conducted by all organizations if they wish to maintain and improve the quality of their products, whether or not they are aiming for certification. An audit is a systematic, independent, and documented process for obtaining audit evidence and evaluating it objectively to determine the extent to which audit criteria are fulfilled. The term systematic means that the company must plan and document its system for auditing. It must have management support and resources (sufficient auditors, time, tools to prepare records like checklists, findings, audit reports etc.) behind it. Evaluating the extent to which the audit criteria are being fulfilled involves an assessment of both implementation and effectiveness. Audits should not be performed to find faults, to apportion blame, or to investigate problems. 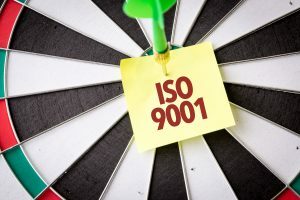 The 9001:2015 standard requires the supplier to establish and maintain documented procedures for planning and implementing internal quality audits. An organization must plan, establish, implement, and maintain an audit program. An audit program includes all activities necessary for planning and organizing the types and number of audits, and for providing resources to conduct them effectively and efficiently within the specified time frame. The complete QMS must be audited at least once a year. The audit program can be presented as a calendar chart showing where and when the audits will take place or as a list of dates. The responsibility to manage the audit program should be assigned to one or more individuals who have a general understanding of audit principles and the application of audit techniques. Ensuring conduct of audits, control of records, review of audit records by specified parties etc. The implementation of the audit program should be monitored at appropriate intervals and reviewed to assess whether its objectives have been met and to identify opportunities for improvements. Results of audit program reviews can lead to corrective and preventive actions and the improvement of the audit program. The main substance of an audit plan includes what is to be audited, against what requirements and by whom. More specifically,, the specific requirements to be checked should be identified based upon risks, past performance and when it was last checked. Detailed plans are best presented as checklists. A well planned audit with a checklist designed to discover pertinent facts quickly is far better than a rambling audit which jumps from area to area looking at this and that without any obvious direction. Checklists help the auditor ensure the depth and continuity of the audit as well as maintain the pace of the audit by saving time during an audit to come to an informed judgement. Experienced auditors sometimes believe a checklist is burdensome and not necessary, however even highly trained medical surgeons and airline pilots use checklists every day to ensure nothing is forgotten, see our post about this here. Other work documents to prepare before an audit are a copy of ISO 9001:2015 standard, forms for recording information, supporting evidence, and audit findings. These work documents should be retained until audit completion. Confidentiality of these documents should be maintained at all times. The standard requires internal audits to determine the effectiveness of the quality management system. Even when one has verified that policies are being met, documenting procedures are implementing policies and the procedures are being implemented etc. one still needs to determine whether the system is being effective. The best method to determine the effectiveness of the quality system is a quality audit. Quality audits should provide the management with knowledge they don’t possess. The audit and not the customer should be the first to reveal any problem. If audits only report historic facts, they are ineffective or reveal facts that should have been detected during previous audits, measures should be taken to adjust the method or the audit plan. Effectiveness is concerned with doing the right things rather than doing things right. Quality costs can help reveal the effectiveness of the system as spending 50% on appraisal and corrective activities is a clear indication that the operations are not effective or efficient. The standard requires the supplier to schedule audits based on the basis of status and importance of the activity. There is little point in conducting in depth audits on activities that add little value. There is also little point in auditing activities that have just commenced as auditors need to gather objective evidence of compliance that may take some time to build up. Depending on the results of past audits, the frequency of audits can be increased in areas that have had higher than average non-conformities and decreased in areas that have had zero non-conformities for past several audits, though all areas should always be audited. Audits should verify that appropriate controls are in place before it is too late. The standard requires that internal quality audits be carried out by personnel independent of those having direct responsibility for the activity being audited. By being independent of the audited activities the auditor is unaware of the pressures and excuses and can examine operations objectively without bias and without fear of reprisals. Audit evidence should be evaluated against the audit criteria to generate the audit findings. Audit findings can indicate either conformity or nonconformity with audit criteria. Nonconformities may be graded or classified. They should be reviewed with the auditee to obtain acknowledgement that the audit evidence is accurate and understood. Auditors should take notes while conducting an audit as informed judgement can only be made with an adequate set of notes containing considerable facts. Notes need to be taken of references to documents, item identification, batch numbers, job numbers, statements, who said them, job titles, relevant questions asked etc. The information should be easily retrievable as it will be used in reports to auditees for the purpose of defining areas of nonconformity or raising points for discussion. Also, the information recorded might be referenced in subsequent audits. It is highly critical to make this information easily retrievable. An internal audit is also a chance for auditors to raise opportunities for improvement or points of concern for which there is insufficient objective evidence to raise a nonconformity. The standard requires the results of the audits to be recorded and brought to the attention of the personnel having responsibility in the area audited. Audits of practice against procedure or policy should be recorded as they are observed and preferably not after the audit as facts can be disputed with time. Therefore it is better to get the auditee’s endorsement to the facts at the time they are observed. The audit report should state a balanced picture of the whole audit, conformities as well as nonconformities and should provide a summary of the nonconformities and suggestions of corrective actions or improvements. The report should be presented to manager of the area audited and should only be presented to the manager’s superior with his/her knowledge and agreement. The report should be sent as soon as possible, but no later than 3 days after the audit. This is quite challenging if notes are taken with pen and paper, a digital software with mobile capabilities dramatically reduces report writing time. All records of the audit and the report should be retained. The standard requires the management personnel responsible for the area to take timely corrective action on the deficiencies found during the audit. Therefore the auditor’s policy manual should define what timely means as what is timely to one person can be untimely to another. In most industries all major non-conformities must be closed within two weeks or else the employee’s year end bonus is impacted. In most cases the auditee’s manager should determine the corrective actions required. Search for other examples of non-conformity and establish how widespread is the problem. Establish the root cause of the non-conformity and prevent its recurrence. This can be done by conducting effectiveness assessments after a long period of time (6 months or 1 year) to determine if the corrective action had the desired long term impact. 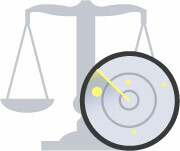 Target dates should be set for all corrective actions in a way that they match the magnitude of the deficiency. Small deficiencies that can be corrected within minutes should be dealt with at the time of the audit. Others that may take longer should be dealt with within a day or so. Big problems may take months to resolve and they could require an orchestrated program to implement. A corrective action when implemented should restore compliance. A corrective action should not be limited to generating another form or procedure as it can be generated by another manager, thereby leaving the deficiency unresolved. The standard does not require follow-up audits but it is a good practice to follow up to determine if the corrective action was taken and if the nonconformity was eliminated by the corrective action. The verification of corrective action could be a part of the subsequent audit or done with a specific effectiveness assessment. The standard requires the supplier to comply with customer requirements for internal system and process auditor qualification. But at the end of the day even Nimonik is just a tool. The real power lies with you, the internal auditor.